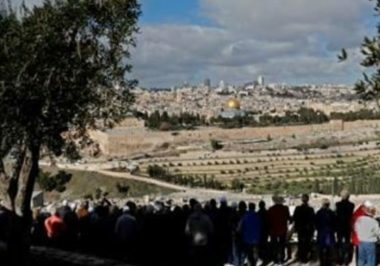 The Israeli so-called “Central Court” in occupied Jerusalem has issued a ruling “temporarily” placing a lien on 2.7 Dunams of Palestinian lands in Jabal az-Zeitoun (Mount Of Olives), including 138 square meters owned by late Palestinian President Yasser Arafat, in the occupied Palestinian capital, Jerusalem. The plaintiffs are demanding compensation, not only from the Palestinian Authority, but also from the late Palestinian President Yasser Arafat, by confiscating Palestinian land. Nearly 0.5% of the land in question, 2.7 Dunams (135 square/meters), is owned by the family of the late Yasser Arafat. The lien was in response to a compensation claim filed by Israelis – not only against the Palestinian Authority, but also its late President Yasser Arafat. The plaintiffs allege that even if the court decides to award them compensation, it will be difficult to receive compensation from estate owned by Arafat and his inhabitants, therefore, they decided to ask for a lien on the property until the desired compensation is paid. Haaretz added that Yossi Arnon, the Israeli lawyer representing the Palestinian Authority did not know about the lien until its reporters informed him of the issue and said that he intends to file an appeal to revoke the ruling. Arnon said that the case is only about “vindictiveness,” and has no legal basis, adding that just because a Palestinian who attacked Israelis came from an area “controlled” by the Palestinian Authority does not make the PA responsible for that person’s actions. “It is like saying that there was a murder in Jerusalem, so the Israeli police is responsible for it,” Haaretz quoted Arnon stating. There are some 120 similar cases against the Palestinian Authority, holding it responsible for attacks against Israelis, including soldiers and colonialist settlers, but such cases have no legal foundation. Palestinians who are imprisoned or killed for attacking Israelis frequently have their family homes demolished by Israeli authorities as an act of collective punishment, in violation of international law. No Jewish Israelis are subjected to the same type of collective punishment, nor have any liens been imposed on Israeli property for the murder of Palestinians. Palestinian civilians have been killed by Israelis at more than ten times the rate of Israelis killed by Palestinians since 2000.